Residents with out-of-state families or regular business travel requirements will find that Northwest Tampa is an ideal location for frequent travelers. Just moments away from the bustling Tampa International Airport, apartments in Northwest Tampa are very convenient for getting to and from the airport without hassles or extensive back and forth commutes. It's also great for its convenient access to nearby St. Petersburg and a quick commute to the downtown and Hyde Park areas of town. Northwest Tampa is a diverse area with unique opportunities for entertainment and shopping. In fact, some of the most notable destinations in the city are located in Northwest Tampa. You don't have to be a certain age to have a fantastic time at Lowry Park Zoo, located on Sligh Avenue right next to I-275. This five-time winner of the TripAdvisor Certification of Excellence is a wonderful opportunity for education and up-close animal experiences just a few minutes away from home. Lowry Park Zoo focuses on endangered and threatened species, giving visitors the chance to see rare species, like the okapi (forest giraffe). The zoo also hosts annual events, like Zoo Boo and the Chinese Lantern Festival, which can be the perfect destination for visiting family and friends. One of the top perks of living in Northwest Tampa is easy access to one of the most distinctive shopping and dining destinations of Florida's West Coast: International Plaza and Bay Street. Always bustling with visitors, this mall is full of life during the day and at night, where find large gatherings of people enjoying music or dining at one of the many restaurants in the courtyard area. 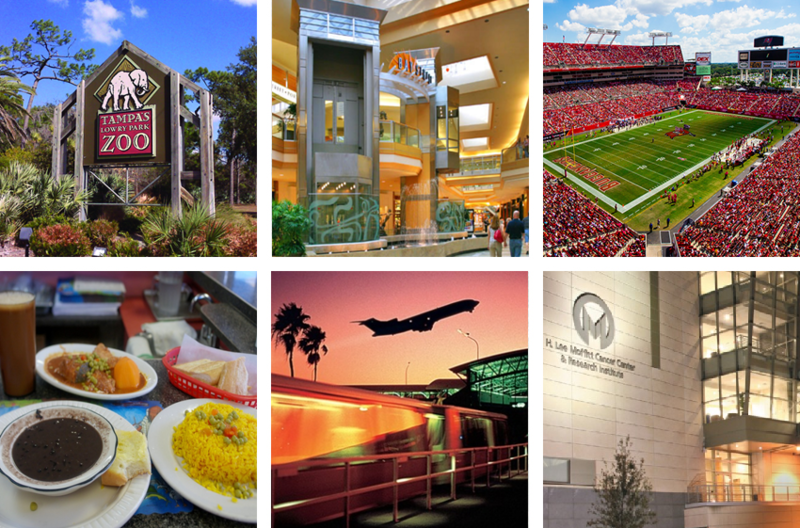 You can't talk about Northwest Tampa without mentioning the famous Raymond James Stadium, home of the Tampa Bay Buccaneers and a multipurpose football stadium that hosts some of the biggest names in music along with well-known sports and entertainment events, like the Outback Bowl and Monster Jam monster truck event. Special features of the stadium include a 103-foot replica of a pirate ship that fires cannons, and two huge video displays named "Buc Vision." Located on the west side of town near the coast, Cypress Point Park is a gorgeous, secluded park with stunning sunsets on the beach. This quiet park offers nature and asphalt trials surrounded by wildflowers and fishing opportunities. Children can enjoy the jungle gym and swings while you cook up something savory on one of the many barbecue grills available near picnic tables or pavilions. Afterwards, take a long walk on the beach with your toes in soft Florida sand. If you love to support your local community and merchants, the Seminole Heights Sunday Morning Market is a great opportunity to mingle with other like-minded people and stock up on some home-grown goods. Running from April through October on the 2nd Sunday of each month, this market is held on the lawn of historic Hillsborough High School and features over 70 vendors with produce, homemade goods, and other local offerings. With International Plaza and Bay Street in town, you'll have plenty of opportunities to shop ‘til you drop! And when you do drop, grab a seat at any of the fantastic dining options to sit back and recharge with delicious food. Don't worry – if you'd rather eat somewhere other than the mall, Northwest Tampa has plenty of other restaurants to choose from. If you're looking for something familiar, Cheesecake Factory and California Pizza Chicken will have all your favorite dishes at these convenient locations. Sushi enthusiasts will definitely want to stop by Zen Bistro Grill + Sushi, a quick stop with fun choices like the Pear Ginger martini and the Rock'n Zen and Eternal Bliss rolls. Sweet stops include the Godiva Chocolatier and Gelateria Del Duomo, which offers mouthwatering gelato in a range of flavors. When asking a local for dining recommendations in Northwest Tampa, chances are you'll hear about La Teresita, where you can enjoy traditional Cuban and Spanish dishes in a comforting family atmosphere. If you find yourself in Seminole Heights for the market, grab a plate from The Refinery, an American restaurant that serves regional fare with exciting ingredients like tangerine juice, fennel, fish, acorn squash with bacon and beurre blanc. If Sunday brunch is more of your speed, Ella's Americana Folkart Cafe has a can't miss Soul Food Sundays with everything from Chicken and Waffles to their award-winning bacon mac-n-cheese. If you're a fan of excellent beers, check out Cigar City Brewing, a major attraction in Northwest Tampa. One of their most popular selections is Hunahpu's Imperial Stout, aged on cacao nibs, Madagascar vanilla beans, ancho chiles, pasilla chiles, and cinnamon. If you're in a rush and still need to get a bite in before your travels, don't discount the Tampa International Airport – with a great selection of restaurants and bars. Well-known throughout Florida, the Columbia Restaurant Café is a smaller version of the restaurant in historic Ybor City that offers many of their signature dishes, like the "1095" salad and "Miranda's Ybor City Devil Crab Croquette." For a quicker stop if you're in a rush, stop by Chili's Too or Nathan's to fill up fast before your flight. Below are a few schools serving apartments near Northwest Tampa. Children in grades K-5 are zoned for Tampa Bay Boulevard Elementary School. Middle school students are zoned for Madison Middle School. High school students are zoned for Jefferson High School. Some of the main private schools include Tampa Catholic High School, Jesuit High School, Trinity School for Children, and Mount Pleasant Standard Based Middle School. For shopping in this area, you'll want to head straight to International Plaza and Bay Street for a multitude of retail options, including department stores and smaller designer shops. Highlights include Free People, H & M, Banana Republic, Nordstrom, and much more. If you still can't find exactly what you're looking for, you can always head to Westshore Mall just down the street for a few additional retail options. The Northwest Tampa area also has a store-packed shopping plaza in the south that includes Target, Whole Foods Market, DSW Designer Show Warehouse, and Nordstrom Rack. This features a unique three level shopping garage for easy access to exactly where you want to go. The business community is strong and thriving in Northwest Tampa, especially with the presence of the Tampa International Airport drawing potential customers and employees to the area. There are several medical offices and small, local businesses that bring unique commerce and goods to residents and visitors. Residents will have a variety of opportunities for employment and career building in Northwest Tampa. Other top employers include Raymond James Stadium and Moffitt Cancer Center, which has a full-service outpatient facility called Moffitt Cancer Center at International Plaza. Roads leading into and surrounding the mall can get busy during peak shopping times, like Saturdays, Sundays, and certain holidays. If you have a reservation to make, give yourself some extra time to park and plan to walk a little if you park far away in the lot. Additionally, if you only need to stop by one store, locate it on the map in advance and park in a convenient location to avoid the more popular lots around the restaurant courtyard.